Like any good whiskey hunter, I was in a liquor store during my lunch break today. I was at the Total Wine, the place where I scored my only 2 BTAC, perusing the ryes. I always go in there once every 2 weeks just in case I get lucky again and a Saz 18 is sitting in the rye section. 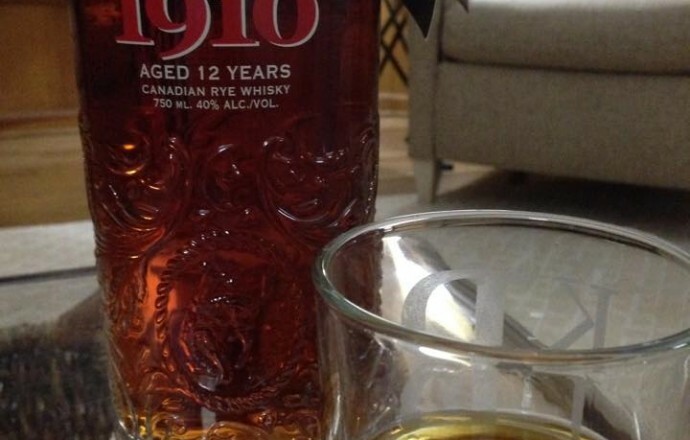 There was no Saz 18, but there was this lovely looking bottle that said 1910, Aged 12 Years, Canadian Rye Whisky. Now I realize not a whole lot of good comes from Canada. They have coins worth $2.50 that allow you to buy a Happy Meal (with a single coin, cool huh? ), and they have like good Hockey Teams and yes Justin Bieber, he’s freaking money, but they also have this rye up there that sometimes makes its way down here. Or I guess a lot of it does but rarely does it get attention. I’ve tried Lot 40, a Canadian Rye that is actually pretty good. And I love me some Whistlepig. So where does 1910 fit in line? Well for starters, it smells like a 2 year old rye whiskey. Like paint thinner mixed with that caramel sauce you pour on ice cream. It’s 80 proof, and since I like my whiskey a little cold, I threw in an ice cube effectively lowering the proof to that of a Schnapps. When you sip it, it starts off a bit like…..like that orange candy that’s wrapped in wax paper that somehow like 2 or 3 end up in your kids’ Halloween basket. Usually you throw it out, but in this case, someone collected it from the trash bins and threw a ton of them into a giant vat of rye whiskey. It’s almost shocking when the flavor hits because it’s just not what I expect with rye. There is no spice, there is no sweetness. It’s like it hits a taste bud that isn’t even defined in Science. The 5th type of taste, notgoodcaramelystrangeness. There is no discernible finish, just an ickyness that leaves you wondering if maybe I have a bad bottle of this stuff. Maybe somehow when they were bottling this they forgot to wash out the hydrochloric acid or the bleach from inside the bottle. Are my insides rotting out? Will I crap blood tonight? I don’t know. Strangely I can’t stop sipping it only because I giggle a little bit each time a bad flavor comes to mind. Rotten bananas, smushed crickets, eating yellow snow, I just can’t stop imagining things that could potentially taste better than this. Oh well, it was worth a $40 experiment. Perhaps I’ll figure out a way to vat this with something else. For now at least, I need to go wash it down with some Listerine.